Summary: Interested in establishing a writing center at your institution? 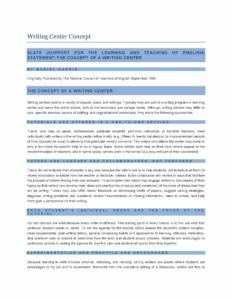 This resource describes all aspects of running a writing center and reviews the many issues to be considered by anyone seeking to establish one, from developing program goals to funding to staffing and staff training. Useful as the focus for a study group, advanced institute or program development meeting, this resource can serve to focus an inquiry into how teachers might take the idea of a writing center back to their schools. Because learning to write involves practice, risktaking, and revising, writing centers are places where students are encouraged to try out and to experiment. Removed from the evaluative setting of a classroom, writers are free to engage in trial runs of ideas and approaches, to fail and move on to another attempt, and to receive encouragement for their efforts. Names of various facilities, such as writing center, writing lab, writing place, or writing room, are meant to encourage this view of the writing center as an informal, experimental, active place. This trying-out can be either in the form of talk, as writers practice formulating ideas aloud, or in writing.